I love featuring pirates and privateers in my books. In the Elizabethan era it was a bit of gray area as I explain below, and the men (and women) who engaged in high jinks on the high seas were perched right on the edge of society. Great hero material! As anyone who’s seen the Pirates of the Caribbean movies could tell you, virtually the only difference between a pirate and privateer was a piece of paper: the letter of marque. A letter of marque sanctioned the bearer’s capture of merchant ships belonging to an enemy nation. Of course, if he was captured by the enemy, the letter of marque wasn’t worth the parchment it was written on and he suffered the same fate as any pirate in that country. 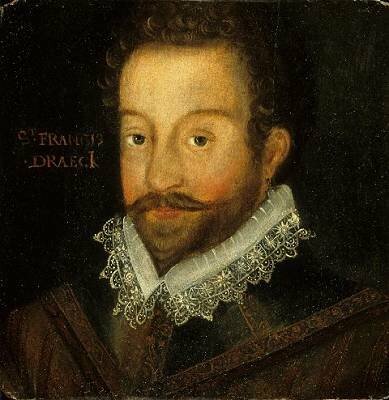 Sir Francis Drake was a privateer, and made himself a nice little fortune by attacking Spanish ships heading to the New World. As part of his deal with Queen Elizabeth, she received a sizable portion of the booty. It was a win-win situation (unless you were Spanish). She not only got a treasury full of Spanish gold but she had an expert seaman at her disposal with a ship and crew ready to sail in time of war if she needed it. Drake was one of her “Sea Dogs” which also included the privateers John Hawkins and Thomas Cavendish. Life at sea was hard and short, for both the pirate’s and privateer’s crew. They ate poorly, slept in cramped conditions, often on deck, and died young. To make food last an entire journey, it had to be stored in barrels of salt or vinegar. A meal on a “fish day” (days designated by the crown as fish-only days – yes they WERE that draconian) generally consisted of biscuit which was like a dog biscuit but harder, stockfish or ling, butter, cheese and beer. On flesh days, beef was substituted for the fish. Yum. Not. 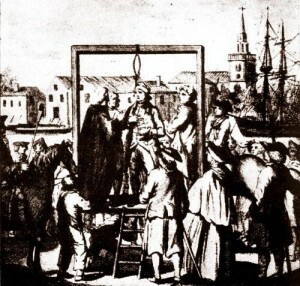 For their crimes, pirates were hung at the Wapping gallows, located on the north bank of the Thames. This gave any visitors arriving in London via the river (the usual entry point for London) a gruesome view, especially since the bodies remained there for three tides. No doubt it served as a deterrent, although how effective it was remains a mystery because piracy was rife.